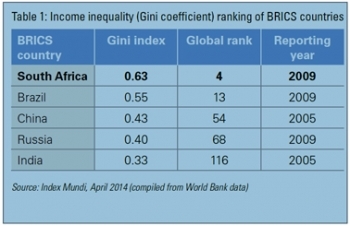 South Africa is ranked the fourth most unequal society in the world. Recent research has shown that the Gini index as a measure of income inequality has some limitations. Margaret Chitiga, Emmanuel Sekyere and Nthabi Tsoanamatsie examine some of these flaws and their relevance to income inequality in South Africa. The Gini coefficient or index is a prominent measure of income inequality. It leverages a scale of 0 to 1 to derive deviation from perfect income equality. A Gini index of 0 would imply perfect income equality, while an index of 1 would imply complete income disparity. The World Bank is the main organisation that provides the Gini index data. However, data is only available for 130 countries. Numerous other organisations provide statistics on income inequality and the ranking of countries using the World Bank’s Gini index data. Among the BRICS countries of Brazil, Russia, India, China and South Africa, South Africa has the highest income inequality index, a Gini index of 0.63, and the highest global ranking as the fourth unequal country in the world. Brazil comes second with a Gini index of 0.55 and a global rank of 13. China, Russia and India follow in the far distance, although the latest data available for China and India was from 2005 (Table 1). In the Southern African Development Community (SADC) region, South Africa ranks third behind Seychelles and Namibia, which have higher Gini indices of 0.66 and 0.64 respectively. In terms of international rankings, Seychelles is ranked as the most unequal country in the world, with Namibia third and South Africa fourth. The Democratic Republic of Congo (DRC) follows closely after South Africa with a Gini index of 0.61 and is ranked fifth globally. However, the DRC’s data is from 1994. The Gini index is a relative measure that fails to capture absolute differences in income. The Gini index has been found to have a number of limitations. The first is referred to as the ‘income concept’. Income can be defined at the household level weighted by household size, other scales or at individual level taking into consideration financial holdings or just wage earnings. Each income definition gives a different measure of income and different levels of income inequality. Thus differences in income concepts can lead to differences in measures of income, inequality and the ranking of countries. A Gini index based on individual incomes is different to a Gini index based on household incomes for the same country. As a result, the rankings of countries change depending on whether the index is based on household incomes or individual incomes, creating some subjectivity in its use and interpretation. The income of the informal sector is also excluded from the measurement of income inequality using the Gini index. In most developing countries, the informal sector accounts for almost 90% of employment. In agro-based subsistence-driven economies, income could exist in different forms other than money. Countries also have different income tax regimes; regressive, proportional and progressive, with some being more redistributive than others. Additionally, the Gini index is a relative measure that fails to capture absolute differences in income. It is possible for the Gini index of a country to rise due to increasing income inequality while the number of people living in absolute poverty is actually declining. This is because the Gini index violates the Pareto improvement principle, which says income inequality can increase with an increase in all incomes in a given society. Thus, although the level of income inequality has increased, the Gini index fails to capture the fact that absolute levels of income have also increased. Similarly, the Gini index could reflect a lower level of income inequality in a scenario where there is a decrease in all incomes in a given society. Furthermore, two countries could have different income distributions but the same Gini index. For example, in a country where 50% of the people have no income and the other 50% of the people have equal income, the Gini index is 0.5. In another scenario, where 75% of people with no income account for 25% of a country’s total income, and the top 25% of people with an income account for 75% of the country’s total income, the Gini index will also be 0.5. Consequently, as a basis for ranking the differences in income inequality between countries, the Gini index could be misleading. The index does not capture social benefits or interventions that bridge inequality between rich and poor. The Gini index also does not capture social benefits or other interventions aimed at bridging inequality between rich and poor. Subsidised housing, healthcare, education and social grants for the vulnerable are measures that subsidise household incomes, reducing income inequality to some extent. Demographic changes or characteristics of the population are not reflected by the Gini index. Countries with high ratios of elderly people whose main sources of income are pensions, or countries with high student ratios are likely to have higher levels of income inequality as measured by the Gini index. Its measure and ranking of a country must be taken subjectively. Income inequality still remains a challenge for South Africa as a country. This is due to persistent racial undercurrents that drive disparities and social stratification in South Africa as a whole. These disparities transcend income to negatively impact access to employment opportunities, education, quality healthcare and basic necessities such as electricity, water and sanitation. Uneven distribution of the gains from growth also means that the quality of life and availability of income earning opportunities are further driven by the part of the country in which a person lives. It must be conceded, though, that South Africa has made impressive strides in bridging the gap in the quality of life between rich and poor in areas such as housing, electricity provision, healthcare delivery and education infrastructure. South Africa has also performed commendably in other development goals such as HIV/AIDS and tuberculosis control, infant/maternal mortality and gross basic school enrolment rates. Social grants reduced poverty by 45% for the lower poverty line from 1993 to 2013. As per the food poverty measure, poverty levels declined from 33% in 1993 to 25% in 2013. In terms of cost to the budget, social assistance in South Africa currently amounts to R120 billion, representing 3.4% of GDP. Social insurance schemes have also been reformed, establishing an unemployment insurance fund (UIF). The UIF now covers previously excluded groups such as domestic workers, seasonal farm workers and other categories that were not included in social assistance schemes. However, the construction of the Gini index does not capture the impact of these interventions on income inequality in South Africa. The limitations of the index as previously discussed imply that its measure and ranking of a country must be taken subjectively and in exclusion of absolute income gains, mobility between income classes, differences in the income distribution of countries, differences in tax regimes and its impact on household disposable income, demographic changes, improvements in development outcomes and other government interventions that actually reduce household poverty. If the Gini index was capable of capturing the impact of all these positive developments in South Africa and the other factors previously highlighted, South Africa’s current income inequality index and international ranking could have been much better. Authors: Prof. Margaret Chitiga, former head of the Economic Performance and Development (EPD) programme, HSRC, currently programme director and head, School of Public Management and Administration, University of Pretoria; Dr Emmanuel Sekyere, senior research specialist, EPD, HSRC; and Nthabi Tsoanamatsie, researcher, EPD, HSRC.